Are you ready for this review? 'Cause, apparently, anything goes when it comes to band - backed beers. Served in the appropriate upside-down Aussie glass, if you're any kind of a beer fan, you'll need a stiff upper lip or big balls to drink this one & enjoy it - it's not going to shake your foundations. Light, sweet, & corny, this beer will have you firing your guns at AC/DC for this offense to brewing & marketing - I guess you could say AC/DC is back in business, and it's a dirty deed done dirt cheap. But... money talks, I guess. I'm sure the band couldn't resist the opportunity. I can hear the conversation now... Female reporter: "What do you do for money, honey?" Band - "We make beer now. Here, have a drink on me." 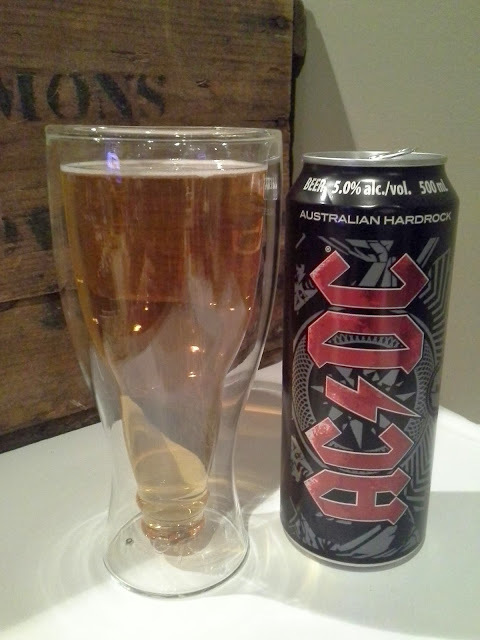 As much as I didn't enjoy it, the beer wasn't undrinkable - it's not on some highway to hell. Try it if you want (or if you dare). I just hope the band didn't think it'd be awesome... promised by the brewer that it'd be packed with TNT, ready to shoot to thrill, only to be shot down in flames. Maybe the band doesn't care. After they got their money, maybe they just decided to ride on to sin city with their new funds to gamble & get all screwed up. I mean, after all, it ain't no fun waiting round to be a millionaire. I'm no cold-hearted man... I just don't want to be beating around the bush. This beer is damned. Gimme a bullet & let me put it to rest. So... enough of this riff raff. I could keep going on like this for a while. I'll have to look for my beery shot of love elsewhere. Thanks. Extra points if you can name the correct number of Acca Dacca song titles referenced in this.